The waxing crescent moon and the dazzling planet Venus are the first two celestial lights to appear after sunset this evening. Look low in the west to see the shining pair at dusk and early evening. After the sun, the moon and Venus rank as the second and third brightest heavenly bodies, respectively. When these brilliant sky objects get together, people across Earth’s entire globe spot them and gaze with wonder. Since the moon is a slim crescent now, you might glimpse a pale glow – called earthshine – on its darkened portion. 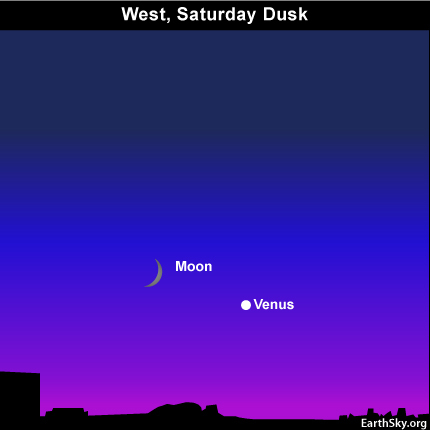 Do not wait too long after sunset, if you wish to catch Venus and the moon. From Earth’s mid-northern latitudes, the pair will follow the sun beneath the horizon about one hour and 15 minutes after sundown. 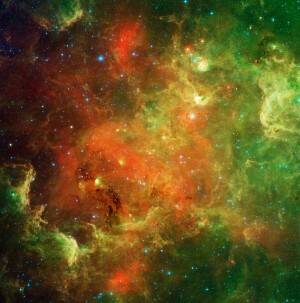 As seen from the northern tropics and the southern hemisphere, they will set from 2 to 4 hours after the sun. In Asia, the moon will come tantalizingly close to Venus, as if kissing it, at early evening. If you have binoculars, be sure to grab them. Scan the moon’s terminator – the shadow line dividing the lunar day from the lunar night. The best view of the lunar landscape is found along the terminator, or where it’s sunrise on the waxing moon. By the way, the best time to observe with binoculars is during twilight, before the sky becomes very dark and the moon becomes too contrasty and bright. If you hold them very steadily, your binoculars might show you that Venus is not quite round. A telescope would reveal that Venus is now in a waning crescent phase, much like a waning crescent moon. For the fun of it, we ask a question that we will answer in tomorrow. Does the terminator on a waning Venus represent sunrise or sunset? With or without optics, enjoy the grand attraction after sunset: the moon and Venus on September 11!